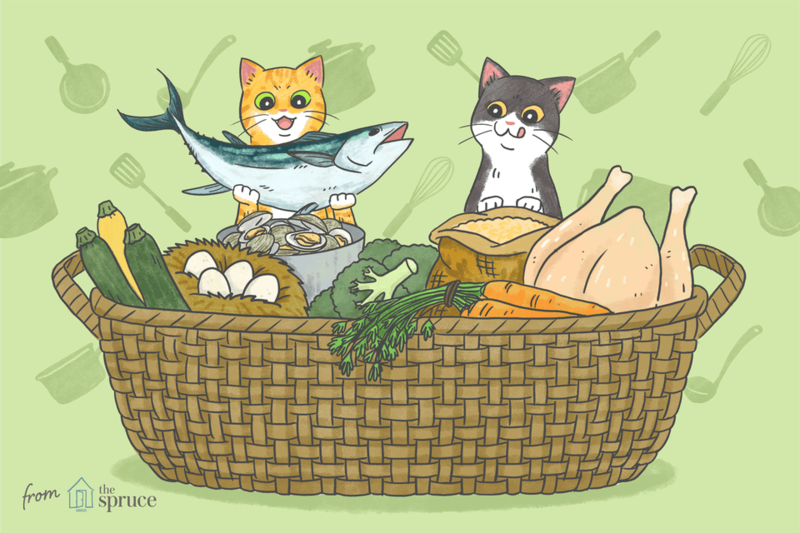 The recipes provide the essential ingredients for a home-prepared cooked diet for your cats. It's best to alternate these meals to ensure your cat gets all the nutrients it needs over a period of time. You may want to start by offering a home-cooked meal once a week as an alternative to your cat's normal commercial foods. Since cats are sometimes known to be fussy creatures, they may enjoy some of these recipes more than others. Feel free to experiment with ingredients, but avoid those human foods that are toxic to cats. Mix together the milk powder with a small amount of water. Pour the mixture into a small non-stick frying pan and cook on medium-low heat until done. Flip over like a pancake and spread the cottage cheese and veggies over half of the cooked surface. Fold like an omelet. Cool and cut to bite-sized pieces to serve. Wash chicken, then cover with water in a large stew pot. Cut vegetables into pieces and add to pot. Cook until chicken almost falls off the bone and vegetables are tender. Completely debone the chicken. This is extremely important, as cooked chicken bones can splinter and cause serious intestinal damage. Pour the stew into a blender and blend or chop until mixture is coarse (about bite-sized). Freeze in meal-sized plastic bags. ²Garlic for cats is in a "gray zone." Some experts believe it causes Heinz body anemia, as onions do; others consider it beneficial for some conditions. Since I have a policy of "better safe than sorry," I have omitted the garlic from this original recipe. The following recipes have been adapted from Home Prepared Dog and Cat Diets by Donald R. Strombeck, DVM, PhD. The book contains 200 recipes, but you have to search through it to find those for cats. It's still an excellent book for your library if you are starting to feed your cat a home-prepared diet. This recipe provides 471 kilocalories, 53.1 grams protein, 27.4 grams fat, and is intended for a healthy cat or growing kitten. Chop the chicken breast and egg. Crush the bone meal and vitamin tablets finely, then combine all ingredients. Refrigerate, then warm slightly before serving. Provides 503 kilocalories, 43.4 grams protein, 28.6 grams fat. Combine all ingredients and serve immediately or refrigerate and warm slightly before serving. Mix all ingredients well, and serve immediately, or refrigerate and warm slightly before serving to "take the chill off." Cats are prone to most of the diseases and conditions that affect humans, and diet can play a large part in the management of those conditions. These recipes were created by veterinarians and/or nutrition experts, and are deemed safe. However, in all cases related to feline health, please check with your veterinarian for approval before trying these recipes, and your cat's condition should be closely monitored while using these diets. We'll start with a common, and not-too-serious condition. This recipe is to be given after one day of the cat's failure to pass a stool. Serve up to twice a day; you may sprinkle the mixture with brewer's yeast if your cat likes the flavor. Anitra Frazier states, "The goal of this diet is to strengthen the pancreas, reduce scarring, reduce insulin needs, stimulate insulin production, replace nutrients lost in urine or because of stress, and prevent the main complications associated with diabetes." Note: I have omitted the garlic condiment in the original recipe, for reasons stated previously. This diet is low-protein, low-phosphorus, normal potassium, and normal sodium. It provides 55 grams of protein and 1000 kilocalories* as mixed. Chop chicken and combine all ingredients. As should be the case with all home-prepared recipes (and canned commercial food), take up and discard the uneaten portion after 30 minutes. This diet is a "test" diet. It omits commonly-known food allergens, including beef, wheat, milk, cheese, eggs, nuts, fruits, tomatoes, carrots, and yeasts. If your cat's allergy symptoms disappear while on this diet but return when he goes back to his regular diet, it's a fairly safe assumption that one or more ingredients in his regular diet is causing the allergy. Cook the rice in 4 cups of filtered or spring water. Bring to a boil, then reduce heat and simmer, covered, for 40 minutes. When the rice is done, add the remaining ingredients and mix well. Freeze about 2/3 of the mixture. This recipe will feed an average cat for 8 to 10 days. Vitamin C (sodium ascorbate powder) 200-400 mg. daily. ¹Adapted from The New Natural Cat by Anitra Frazier. ²Adapted from Home Prepared Dog and Cat Diets by Donald R. Strombeck, DVM, PhD. ³Adapted from Dr. Pitcairn's Complete Guide to Natural Health for Dogs and Cats by Richard H. Pitcairn, D.V.M, Ph.D. and Susan Hubble Pitcairn. *About three days' caloric requirements for a 9-10 pound cat.